At 2.45pm on Sunday 2nd August 2015, BT made history by launching the first broadcast channel in Ultra HD format in the UK. 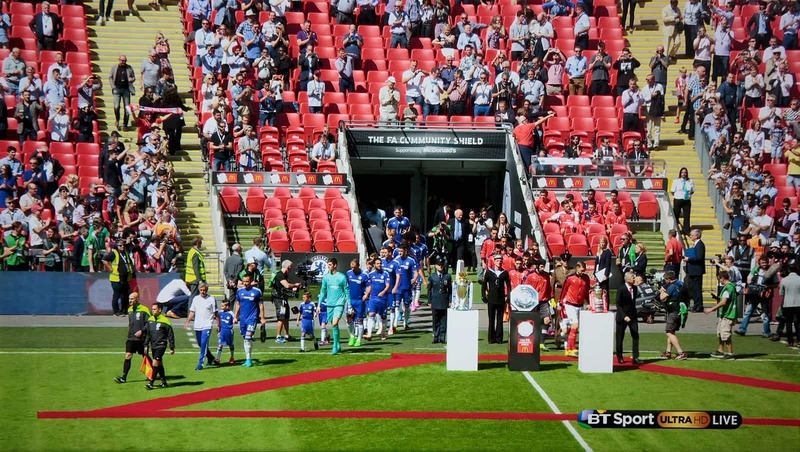 On its new BT Sport Ultra HD channel, delivered by fibre broadband, BT screened the 2015 FA Community Shield - a live football match between Arsenal and Chelsea at Wembley Stadium. 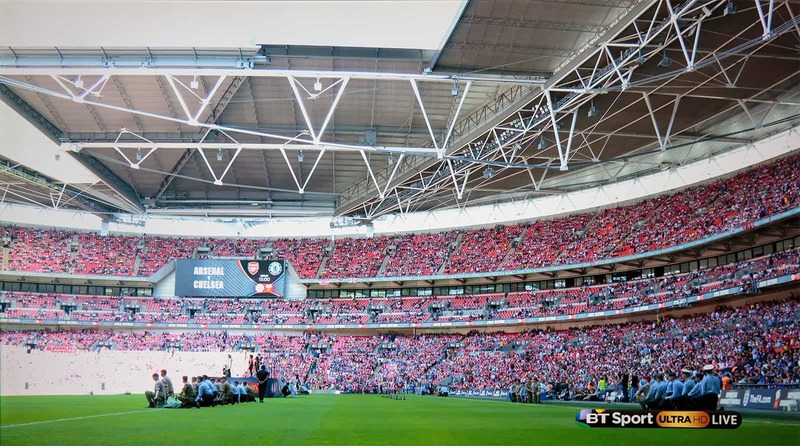 The Ultra HD cameras certainly captured the scene at Wembley Stadium better than we have ever seen before on TV, with images seeming much more real and lifelike. The cameras really captured the enormity of the crowd. We could make out individual faces in the crowd - just like you can when you are there in person. 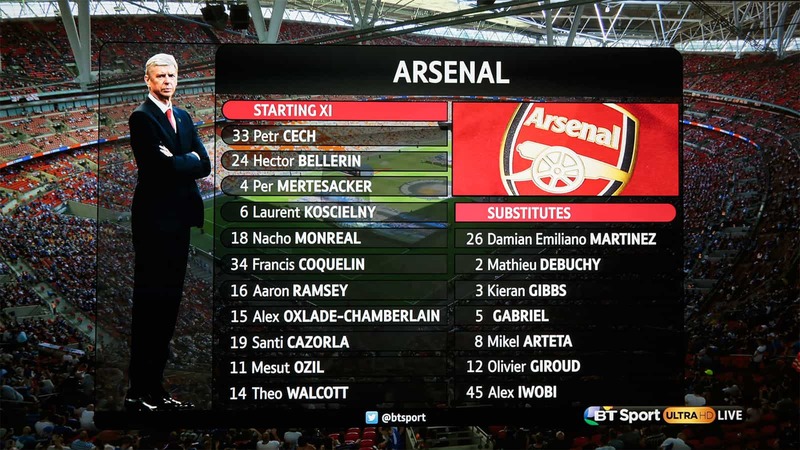 All the images shown here were photographed from the screen of a Sony Ultra HD TV and do not do the broadcast images justice (as they are in lower resolution). Any graphics that popped up on screen looked spectacularly good. Being super sharp and so rich in colour, they looked almost surreal. When the teams came on to the field, we could make out every player and their facial expressions - as well as those of the crowd behind too! Once we had got used to this new sharper view of football, flicking back to the HD version was rather painful, with finer detail disappearing. Based on what we saw today, Ultra HD really is the future of television. If only the Ashes were being shown in Ultra HD! We were also very impressed by the quality of motion, showing that a frame rate of 50 frames per second can provide fluid motion provided that camera operators are well trained. The camera operators for this match had clearly been trained on effective techniques for filming in Ultra HD and they resisted the temptation for rapid blurry pans from one side to the other. Overall, we were very impressed with BT's first Ultra HD live broadband. As we recorded the match, we now have some excellent Ultra HD demonstration material that isn't dominated by buildings and slow motion! After watching some of the Ultra HD content available from Netflix and Amazon, sometimes it can be a challenge to see a huge difference between that content and a good HD source. Today, the super-sharp images from a live broadcast - probably helped by the 29 Mbps data rate used - provided clear evidence of what Ultra HD is capable of. We look forward to seeing more content of this quality, which is bound to increase the demand for Ultra HD. 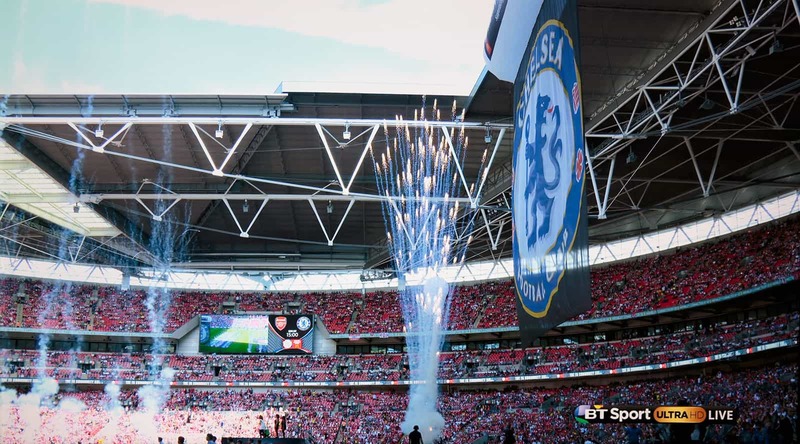 What made today particularly interesting is that the UK's first Ultra HD broadcast was actually delivered by BT's fibre broadband network and not by satellite. Who would have guessed that years ago when Sky launched its innovative HD service? Based on the transformation we saw today with television sport, we think that Sky has missed a great opportunity to give its customers an early enhanced viewing experience. For more information, please read our review of BT's Ultra HD service. For the latest BT offers, visit BT's website.